Reduces compression in thin sections. 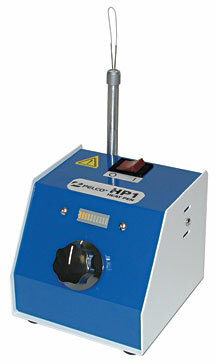 The PELCO® HP1 Heat Pen is a useful tool for flattening thin sections cut by an ultramicrotome. Passing the heated filament over the sections, while still in the knife boat, will flatten them. Variable temperature setting for optimum effectiveness. The PELCO Heat Pen has a nichrome element that becomes incandescent during use. 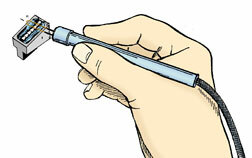 A red hot tip, like our Heat Pen has, gives off a large amount of radiant heat. This results in more efficient heating of the sample at a safer distance. A hot tip that is not glowing red like found in battery operated versions would have to be brought close enough to the sample to heat it by air convection/conduction which would take longer and put the sample at risk. Some other advantages are: Variable element power (heat), quick response time of element temperature when setting is changed, the level of the heat is visually indicated by a 10 color LED bar and a lightweight easily manipulated heating element wand. User selectable voltage. The above method replaces the solvent vapor method which is harmful to the operator and gives less reproducible results. Stratton CJ, Bayguinov Y, Sanders KM, Ward SM, 2000: Ultrastructrual analysis of the transdifferentiation of smooth muscle to skeletal muscle in the murine esophagus, Cell Tissue Res, 301, 283-298, (Materials and Methods).